My jaw dropped open. I had been fooled! The high contrast of the rich wood color and the beautiful glass backsplash glowing from the undercabinet lighting made me a Birch fake-out believer right then and there. You can get the look of Cherry by using a Birch wood with the right finish applied. 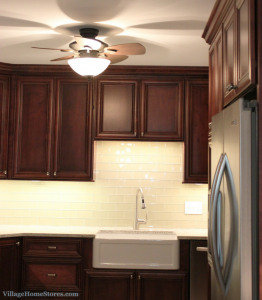 Before we take a look at the layout and finishes let’s get right to the standout combination of this glass subway tile backsplash all aglow with the new Diode LED lighting! 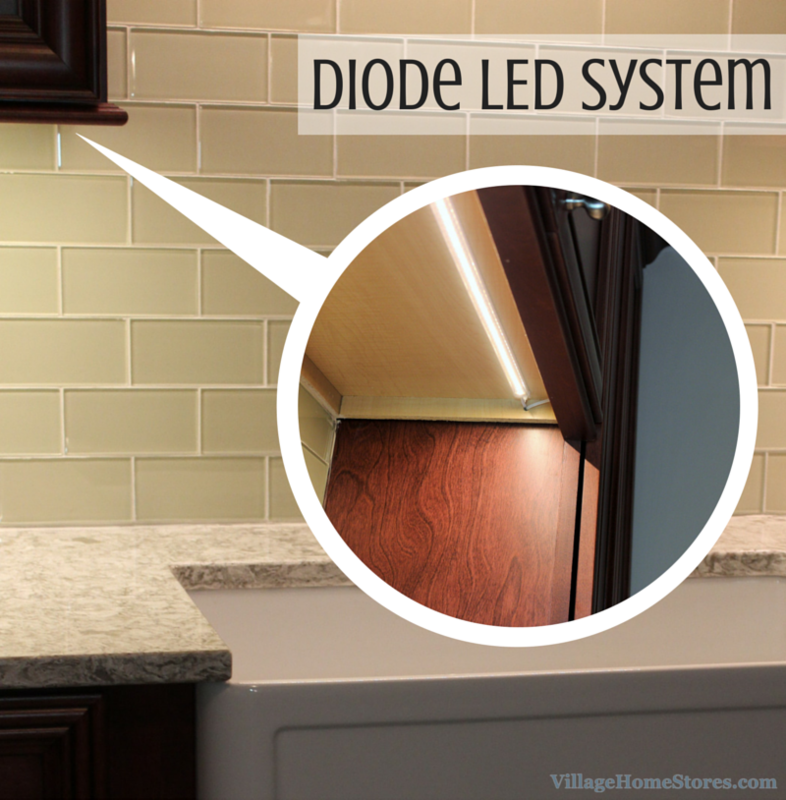 Our Diode LED system can be installed in a traditional undercabinet installation like shown here. This low-profile system can be used a number of other ways as well. 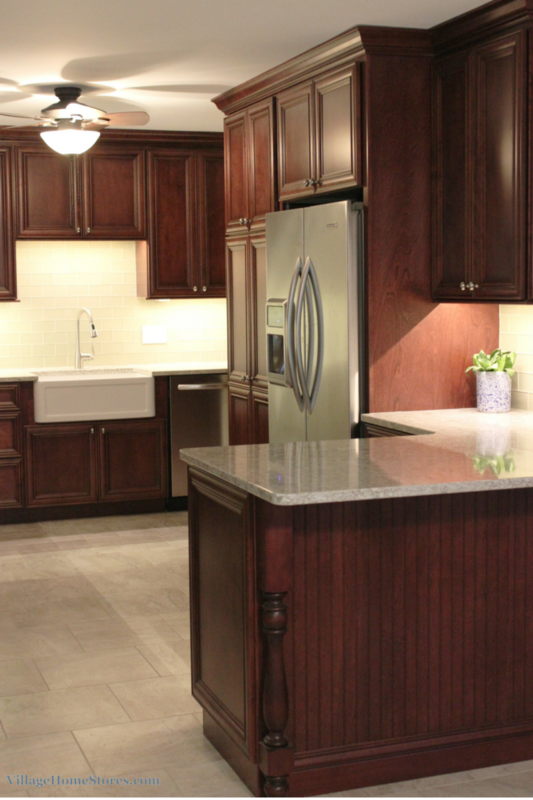 Consider some accent lighting above your kitchen cabinetry if there is a space from there to the ceiling. How amazing would the baseboard area below a bar or home entertainment center look with an accented area lit up? This lighting system can even be put onto a dimmer switch. The homeowner just purchased this Rock Island home in the Fall and immediately got in touch with us to do the full remodel for her. Using our Project Management program we managed everything for her including gathering estimates and scheduling and coordinating all of the crews involved. 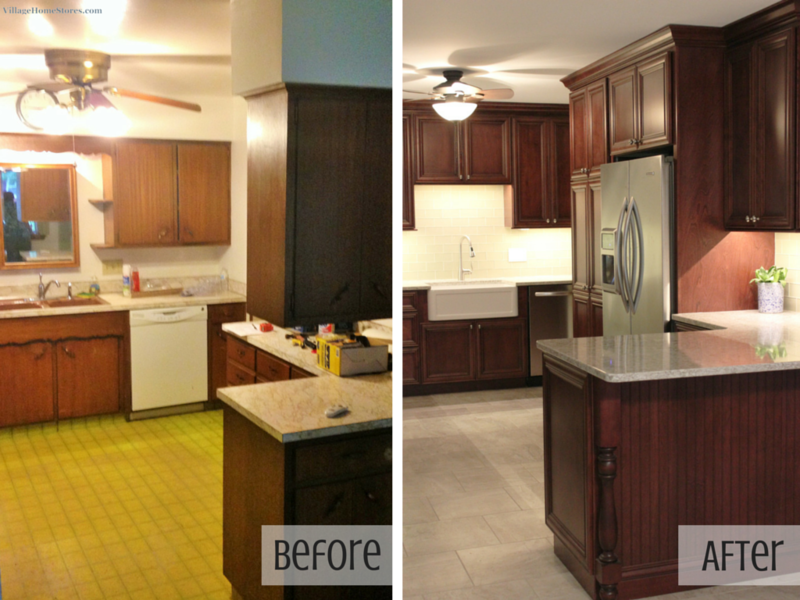 We removed the existing peninsula and wall cabinet above it and an exterior wall was rebuilt and moved out to now give her plenty of space for a small dining table just outside of the new kitchen. 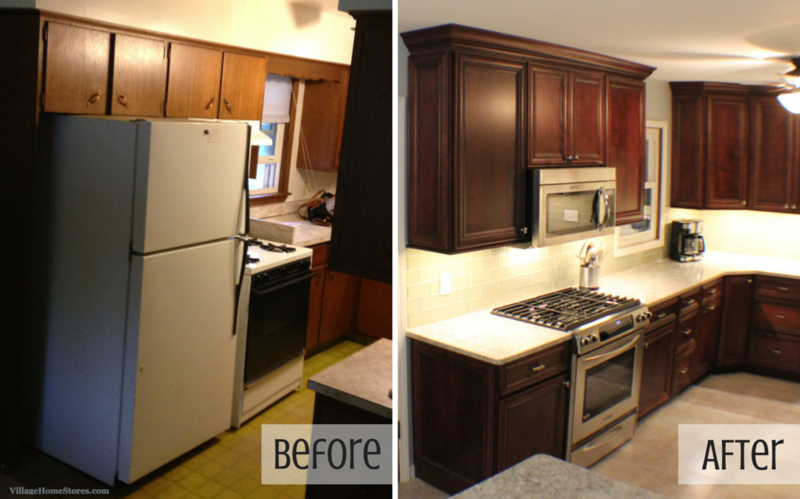 The refrigerator was moved to the opposite wall which created a lot more space for the user who is at the new gas range. The refrigerator now has a large pantry cabinet to the left and allows the front end of the kitchen stay feeling open and spacious. Because the kitchen is the very first room you see when you enter the home, the back of the new peninsula couldn’t have just a plan look. The new kitchen design includes an overhang that can comfortably seat two guests. Below the overhanging Cambria quartz is a beadboard panel with a furniture baseboard attached. 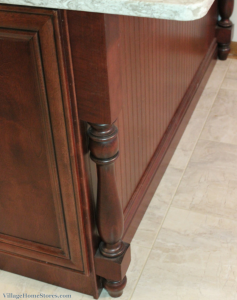 On each end of the panel are decorative turned posts that match the cabinet finish. This one detail truly takes the first impression to the next level. The same materials can be installed in a different way as well. These posts are finished all around so that they can be pulled forward and give the look of a table leg. Either installation method makes a great impact. The cabinetry that gave the rich look of Cherry is actually a Birch wood in the “Burgundy” finish with a black accent glaze applied. 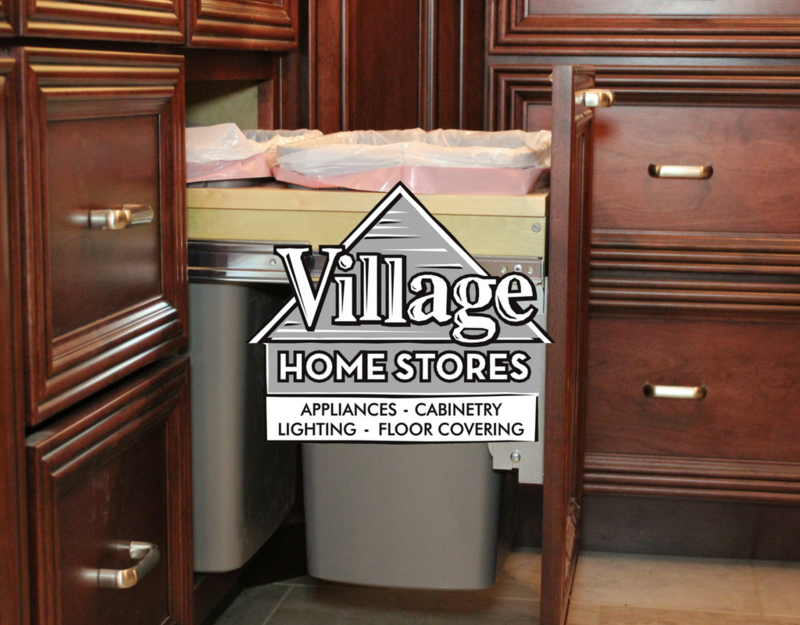 The cabinets are from our Koch line and are a doorstyle called “Legacy”. 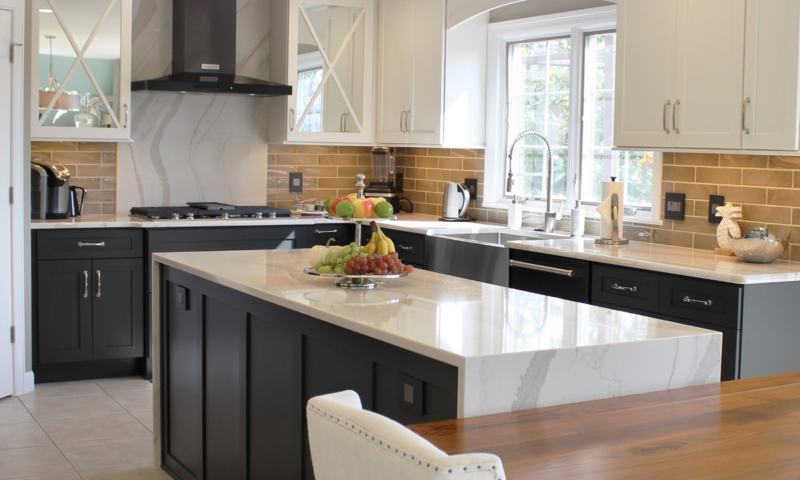 The Cambria quartz countertops are the “New Quay” design. See the other complimentary Cambria colors to this color here on the Cambria site. 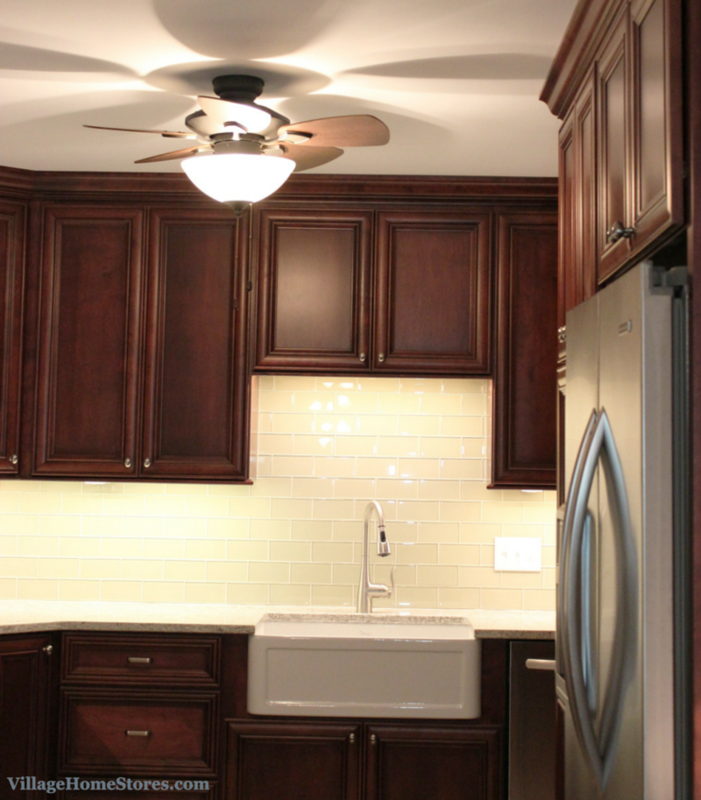 The 3′ x 6″ glass backsplash tiles are available in many colors to match your own space. 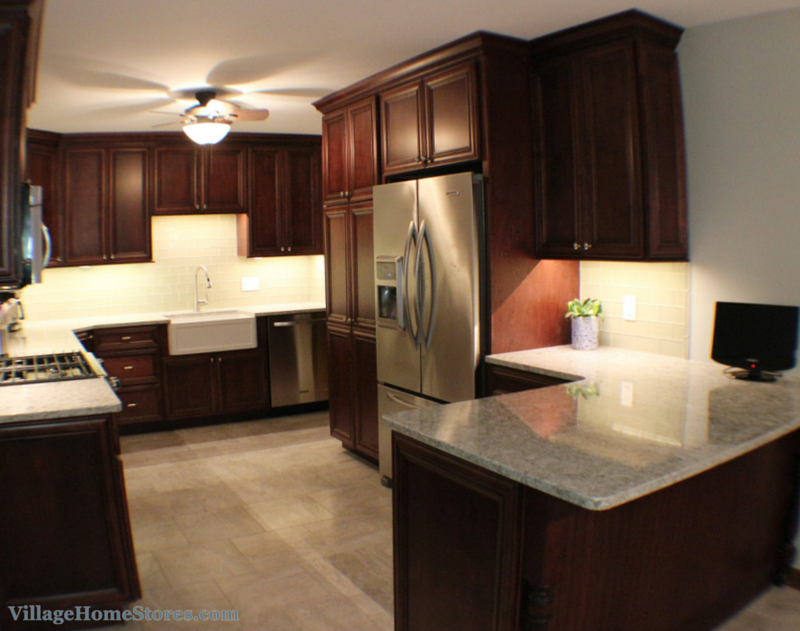 The flooring in the new kitchen is another great example of a fake out! Looks like ceramic doesn’t it? It is actually Luxury Vinyl! 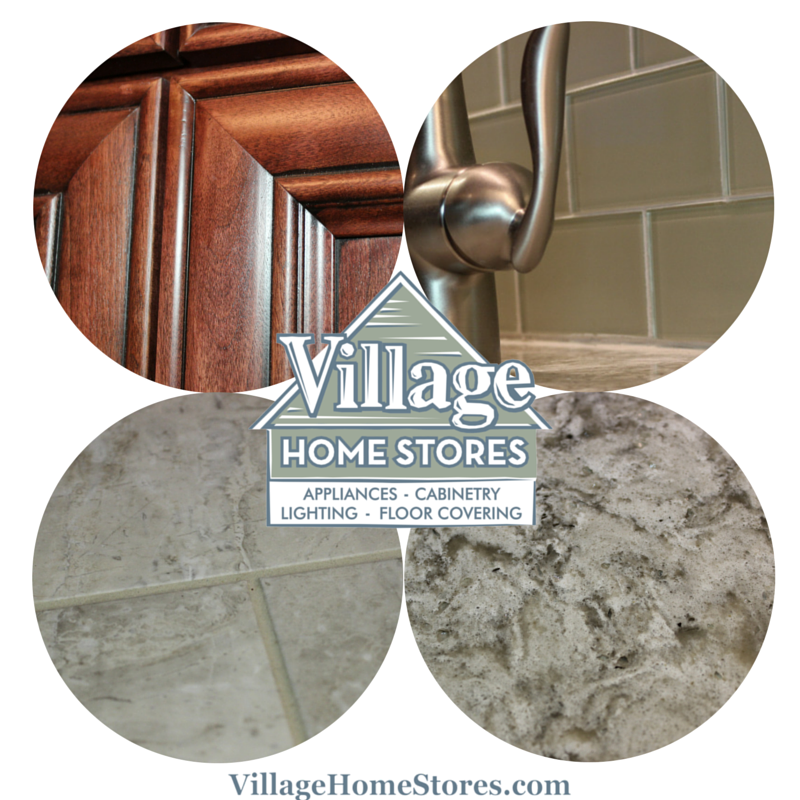 These 16″ x 16″ tiles by Mannington are in a color called “Cloud Cover”. Luxury Vinyl Tile, or “LVT” gives the look of ceramic but offer the comfort of a softer (and warmer to your bare feet) material. LVT can also be installed grouted or non-grouted. If you have any questions about the materials or design of this space feel free to contact us anytime! Or call us today to make an appointment and start talking about your own project! 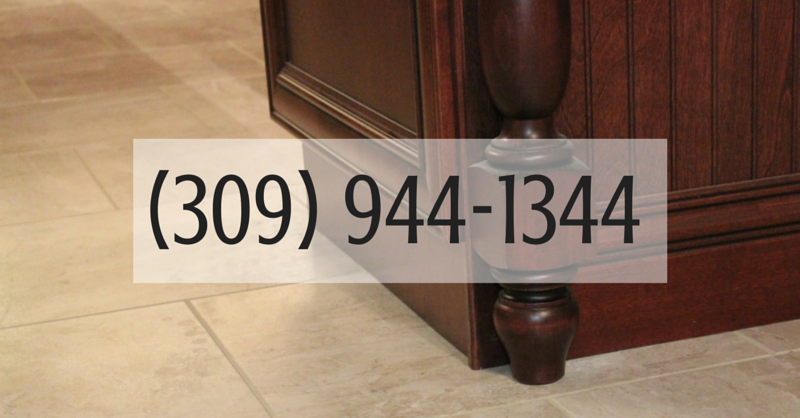 You can reach us at (309) 944-1344.